Why choose between a delicious chocolate and a delicious yellow cake when a marble cake can give you the best of both worlds? This is a dessert that never disappoints. Mmmmmm….. It is the perfect balance of yellow cake with swirls of chocolate, makes beautiful cake layers as well as cupcakes, and it is sturdy enough to hold up well to fondant too. Marble cake is a type of cake that has contrasting swirls of batter, giving a fun marbled or swirled pattern to your slices. The contrasting swirls may be from a different flavor of batter, or simply batter that has been tinted. 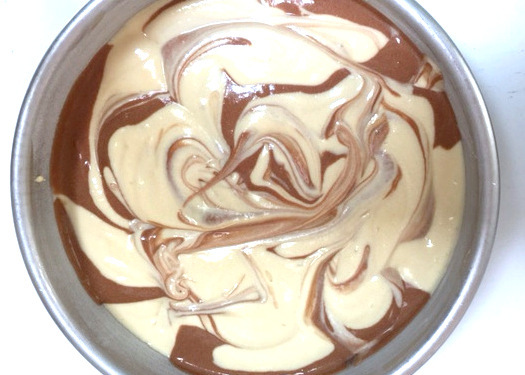 Once the two types of batter are in the pan, you can lightly drag a knife through the batter to create the marbled effect. Years ago, when making marble cake, I used to prepare a chocolate cake recipe and a yellow cake recipe separately and then combined them. That’s just too much work and too much batter. Other recipes call for melted chocolate. With this Marble Cake technique, simply choose your favorite yellow or white cake recipe, and reserve a little to combine with cocoa powder for your swirls- what could be easier? I just LOVE the combination of yellow cake with chocolate and so this recipe is based on our favorite scratch Yellow Cake. However, no matter what recipe you are using (whether yellow or white cake), you can follow the same technique! When you take a closer look at our Marble Cake Recipe, you’ll notice that it calls for the Reverse Creaming Method of Mixing. With this mixing method, ingredients are added in a different order than you would expect if you are used to the conventional method of mixing. We find that it results in a super moist, delicious, and slightly denser cake. If you’d like to learn more about this method, or to see our free video, click here: Reverse Creaming Method of Mixing. Also, our cake is frosted with our most favorite Classic Chocolate Buttercream Recipe which you can find below! To create a marbled effect with your cake batter you first need to make your white or yellow cake batter. Next, take a few tablespoons of unsweetened cocoa powder and mix with a bit of hot water. Stir until dissolved. Scoop some of your cake batter into a small bowl (see recipe for details) and combine with the chocolate mixture to create chocolate batter. Next, scoop spoonfuls of batter into the pans, alternating between the yellow and chocolate batter. Now for the fun part! 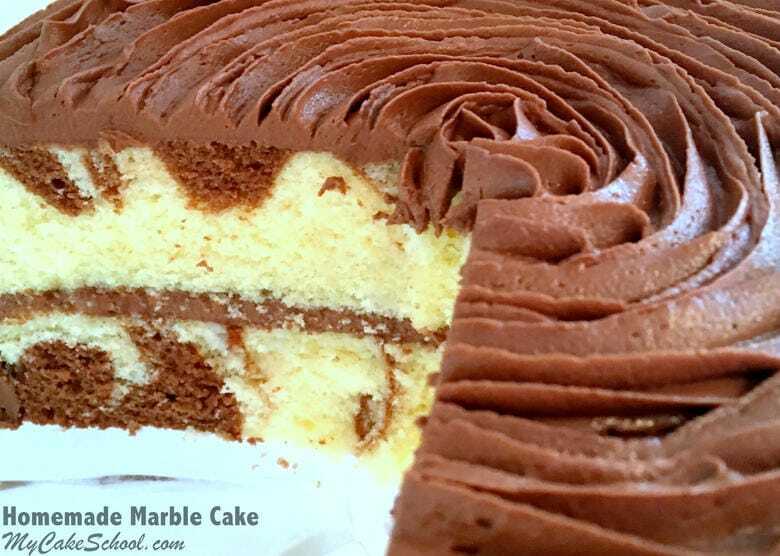 Let’s bring some marble to this marble cake by dragging a knife through the batter. It’s up to you how marbled you make it, although you have to stop yourself from having too much fun or you’ll loose your beautiful swirls! That’s all there is to it! Bake, fill, frost, and enjoy! We hope that you love this recipe as much as we have. It’s guaranteed to please any crowd. You can find our Classic Chocolate Buttercream recipe here! It has a wonderful chocolate flavor, is simple to make, and pipes beautifully! 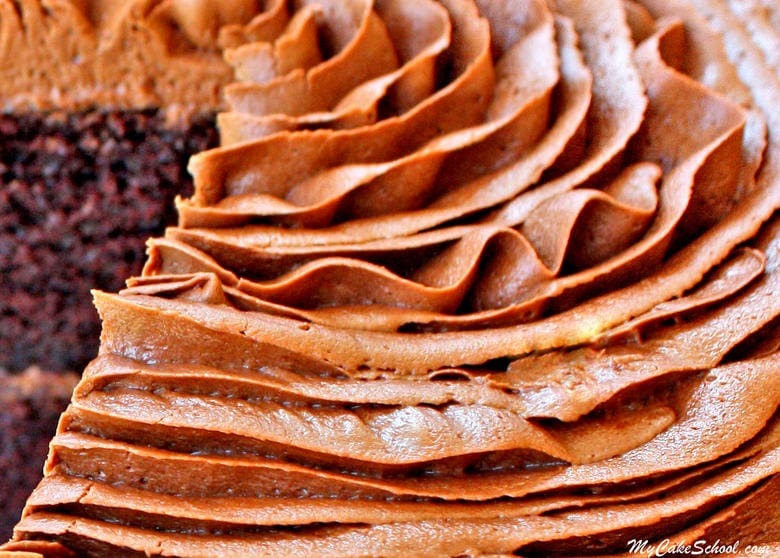 :Classic Chocolate Buttercream. 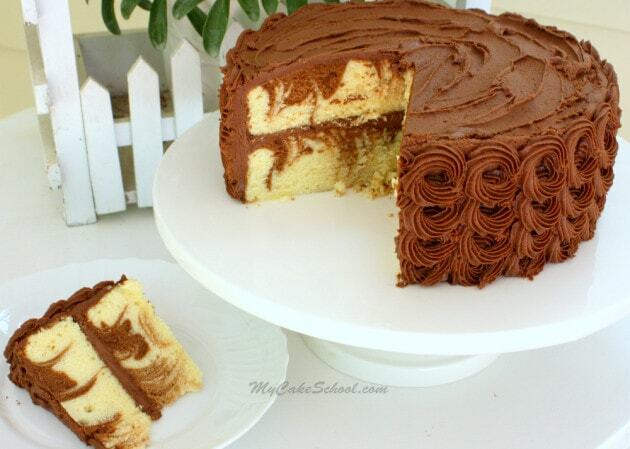 If you love Marble Cake, you should try changing things up a bit sometime with Zebra cake! The same idea as marble cake, only with a zebra print pattern! You can find our free step by step tutorial here: Zebra Cake Tutorial. Don’t miss our Yellow Cake from scratch recipe! 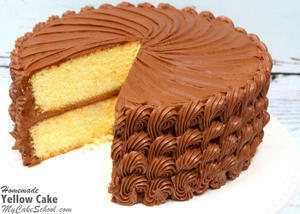 This is the delicious recipe that we based our marble cake recipe on. You can find it here! : Yellow Cake Recipe from Scratch. Thanks for stopping by! Make sure to check out our full collection of favorite cake and frosting recipes in our Recipes section! If you are interested in learning more about cake decorating, you can find our free cake tutorials here: Free Cake Tutorials Section. Or, if you are interested in gaining full online access to our entire collection of cake decorating video tutorials (hundreds!) you should consider becoming a member of My Cake School! 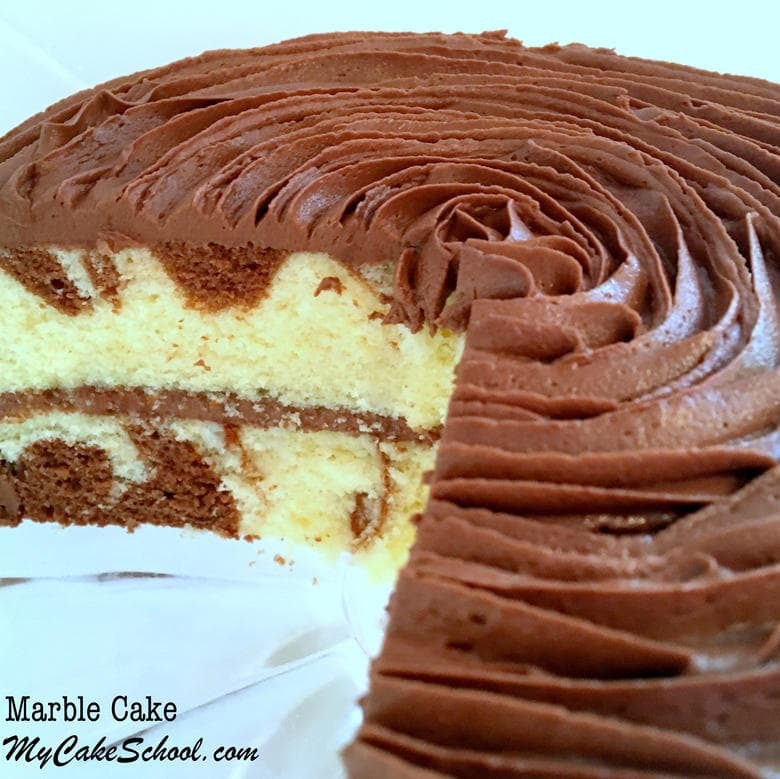 This moist and delicious Marble Cake recipe is always a crowd pleaser! Frost with your favorite chocolate frosting (we love it with our Classic Chocolate Buttercream)! 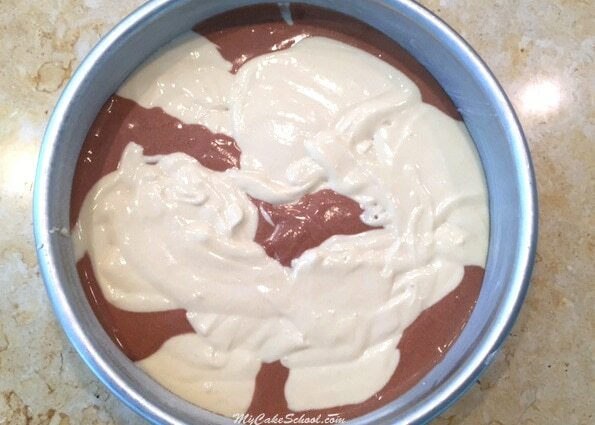 Put 1 1/2 cups cake batter into a medium sized bowl and stir in the chocolate mixture to create chocolate batter. Now it's time to marble our batter in two 8 inch pans. Hi Cindy, I’m happy you gave the recipe a try! Your cake looks good, the most important thing is the taste. I’m glad you enjoyed it. Thanks for the recipe! I love all that I have tried. The cake came out good but was a little dry…could I increase the oil or add mayo or sour cream to help with that? I also used your freezing method.